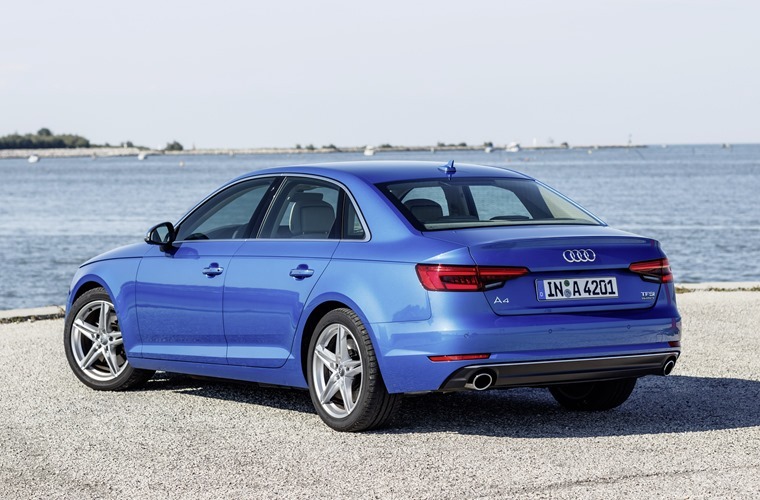 More elegant than ever, the 2016 Audi A4 TDI is ready for action. A nice crisp design envelopes many excellent technologies to help make the Audi A4 TDI a desirable car. A powerful and efficient diesel engine combined with a ride quality that is quiet and refined give the new Audi an edge on the competition. Add the Quattro option, and the A4 AWD TDI sedan is first class, and arguably best in class. Some of the most notable improvements on the new Audi A4 TDI are in the areas of weight reduction, more power, better fuel efficiency, larger dimensions and more high-tech gadgets. Having lost up to 120 kg on some of the A4 models, the marriage of lower weight and the 0.23 drag coefficient exterior design equates to a class leader in the way that a medium-size car can slip through the air. The new Audi A4 TDI is also very quiet, with low road noise and little wind noise. On the topic of environmental preservation, the new Audi A4 TDI sedan puts out only 121 g/km of CO2 emissions. Equipped with Quattro traction, the Audi A4 2.0 TDI Quattro has excellent grip on any road surface, and even in the wet the car remains nicely in control with high levels of grip and adhesion available. Steering weight and feel are responsive, and the turbo-diesel engine provides loads of power at any engine revs ensuring an inspiring drive for the enthusiast. Rated at 140 kW between 3800 and 4200 rpm, the Audi A4 2.0 TDI Quattro can really move when required. Torque is a lusty 400 Nm that is available from as low as 1750 rpm. It is easy to access the power from the flexible and efficient engine. Audi claim that the new A4 TDI can complete the 0-100 km/h sprint in 7.2 seconds. On the right piece of road the sedan can run onto 235 km/h. Sport and Comfort are modes offered for the driving experience. From the driver’s seat, the controls are neatly placed around the dash. The steering wheel looks great and feels superb. Infotainment controls are closer to the centre console, and MMI functions are the very latest. The 8.3-inch colour display screen boasts new navigation, touch capability, LTE connectivity, and WiFi functions. Audi’s virtual cockpit is a really cool addition. The driver can keep his eyes close to the road when checking navigation prospects. The Audi Matrix LED headlights, Audi’s smartphone interface, the Bang & Olufsen Sound System with ten speakers and surround sound, the Audi phone box with wireless charging, the head-up display, and the Audi connect services are all standard Audi A4 2.0 TDI Quattro features. Interior comfort is first class, with leather appointed interiors the standard. Automatic climate control, and electric windows and seats are also standard. The A4 has been designed to seat four-to-five adults in comfort. Not only is the 2016 Audi A4 a leader in weight, aerodynamics and new technologies, the sedan is able to offer plenty of luggage space. The sensor-controlled opening and closing of the luggage compartment means that getting luggage into the boot cavity is a breeze. New for 2016 is the very smooth seven-speed Stronic transmission. This redesigned automatic transmission now offers a fuel-saving freewheeling function. Wheel-selective torque control supplements the work of the front-wheel drive and the quattro drive system. The results are class leading traction and smooth engine-to-transmission operation. New levels of safety equipment that you’ll find on board the new Audi A4 TDI are features like adaptive cruise control, parking assist, rear cross-traffic assist, exit warning, collision avoidance assist, turn assist and the Audi pre-sense systems. Camera-based traffic-sign recognition is also available. Providing one of the most satisfying driving experiences, the Audi A4 2.0 TDI Quattro sedan is a complete drive. For any more information on the Audi A4 2.0 TDI Quattro or, for that matter, any other new car, contact one of our friendly consultants on 1300 303 181. If you’d like some fleet discount pricing (yes even for private buyers! ), we can submit vehicle quote requests out to our national network of Audi dealers and come back with pricing within 24 hours. Private Fleet – car buying made easy!